The wedding invitation will be the first time that many of your guests discover that you are getting married, so you’d better get it right! 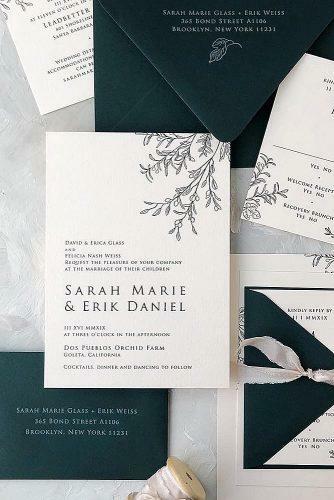 Proper wedding invitation wording may seem like a no-brainer at first glance but you’d be surprised at the amount of etiquette and formality that go into these short notes, and that’s what we’re here for. 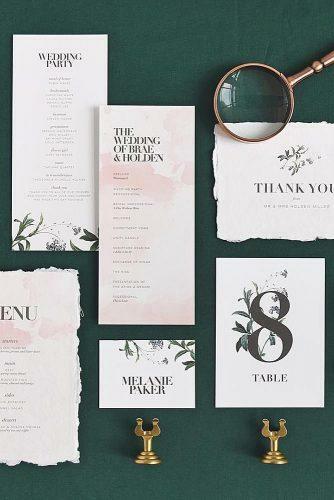 With our help, you’ll learn all about appropriate wedding invitation format and make sure that you hit all of the nuances that some couples overlook. 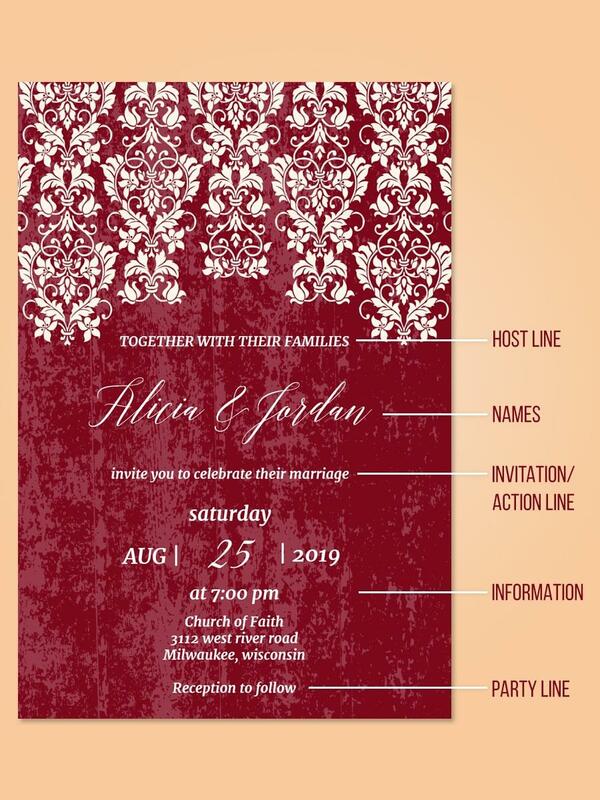 There are many variables that dictate the exact wedding invitation structure to follow. The first we’re going to cover is your style and theme. 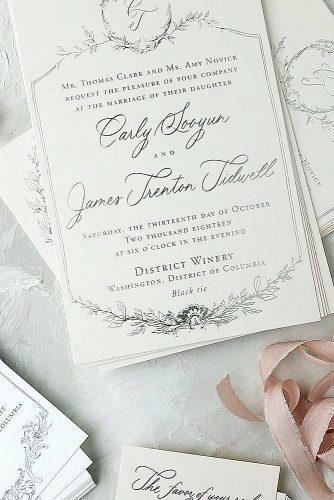 Before you get started with your invitations you’ll have to make sure that you’ve firmly decided between a Traditional, Formal, Informal, or completely unique theme so that you can send specific, for example, rustic wedding invitations if that happens to be your theme of choice. The second item to consider is the time of year. 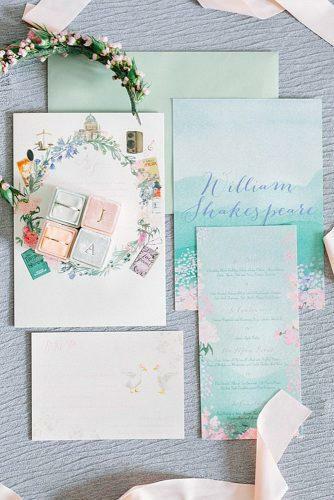 Summer invitations will always be a little different from winter wedding invitations since a formal invitation will include details about the theme and expected dress code. Emails, Texts, or good old fashioned snail mail, make sure to consider all of the pros and cons. Some methods are faster, more convenient, and easier to make changes to if the need arises. Setting up a Facebook page and event, for example, is a really quick and easy way to spread the word and keep track of your RSVPs. But, some of your guests may not be too tech savvy or check their inbox very often. Our advice is to go the old fashioned route. Emails are far too easy to miss or forget about, and there’s something special about a handwritten letter printed on nice cardstock. Whose Name Goes First On The Wedding Invitation? Now that you have the basics covered, it’s time to get specific. The first question is; who’s name goes first, the bride or the groom? Traditionally, whoever is hosting the wedding will get first billing. This is usually the Bride’s parents, making the Bride’s name the appropriate choice. In cases where there are co-hosts or two brides, the couple will have to decide for themselves. If you’re having difficulty, say the names out loud and see if any option has a better ring to it. Now that you have the concept in mind, it’s time for some samples! Sample wedding invitations of real couples demonstrate exactly what should be included. They all seem very simple, but if you pay close attention you’ll notice some subtle differences. Also, check out a general outline of how the wedding invitation often breaks down, with specific examples to follow. Together with our parents, we. Although it seems simple, but when it comes to putting pen to paper you may find that you’re second-guessing yourself. It’s only a few lines, but there’s tons of information in each word. Don’t worry, the following steps break down the order and significance of everything you have to write. Host Line: This line is dedicated to honoring the host. This is typically the Bride’s parents and should begin with the father and then the mother. This is the formal way to write it, but with today’s etiquette, it’s very much appreciated to include both sets of parents. If you are paying and hosting the wedding yourself, place your own names starting with the groom. Line of Invitation: “Would love you to join…”, “requests the honor of your presence”, “the pleasure of your company”. Whichever way you choose to say it, it’s a formal invitation to attend your wedding ceremony. It means that you value their relationship and that your ceremony will be enriched with their participation. Couple Names: Traditionally the bride’s name goes first. But, with modern families, there are often two brides or two grooms. With these cases there are no wrong answers. Choose amongst yourselves, flip a coin, or go by alphabetical order. Or, whoever popped the question gets their name first. Call to Action: This line specifies the main event” the wedding ceremony. Traditional wedding invitations will be written “In witnessing the marriage of their daughter (name) to (groom’s name. if you’re working in a more modern style feel free to get creative with your adjectives. When working with religious wedding invitation wording, it’s appropriate to write this line as “to the solemnization in holy matrimony of their daughter (bride’s name) and (groom’s name). The full first, middle and last name should be used for both the bride and the groom. Wedding Information: This is arguably the most critical section of the wedding invitation. It tells your guests where the event will take place and exactly when to arrive. To satisfy tradition, write the dates out in full instead of using numbers. This looks a lot fancier and avoids any possible misunderstandings. “The Fifth of April, Two Thousand and Eighteen” is crystal clear. Depending on how you read it, 04/05/18 Could be May 4th or April 5th which would be a terrible mistake. You should also be very specific about venues if the ceremony and reception are taking place at different locations. Go to the trouble of including both addresses and both arrival times. What to Come: Lastly, point out certain events and expectations. Call out a brunch that takes place prior to the ceremony or the refreshments you’ll be providing between the ceremony and reception. Make sure to suggest any special attire like dancing shoes, and remember to be very clear about location and timing. Even if you’re working totally against the grain and getting totally creative with every aspect of your wedding, it’s still nice to follow a little bit of tradition. As a bare minimum, here are the basic ingredients that you should try to include. Ladies first. It’s customary to give the bride first billing when writing out the couple’s names. If there are any titles involved – esquire, MBA, etc.. – feel free to include these. Get as creative as you desire, but some information is critical and must appear on the wedding invitation in order for it to serve its purpose. Include the Host, Line of Invitation, Couple’s Names, Call To Action, Ceremony, Reception, and all other Event details. Use a separate card for the RSVP. Include registry details and a clear way for them to choose reception menu items. Make sure that dates and times don’t need any explanation, they should be clear as day when read. This is especially true for when there are multiple locations to attend. Make sure to include the return address (or digital destination if you’re opting for Emal or Social Media) for the RSVP card. An accurate headcount is crucial for planning meals and seating arrangements. 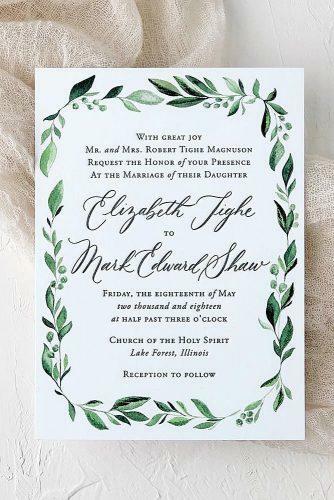 Traditional wedding invitation wording has spent decades slowly evolving into what we see today. The past few decades, however, have been the most drastic. Not to worry. traditional wording for wedding invites can be easily adapted to work for our modern families including divorced parents, single parents, multiple sets of parents, and all of the other structures. This structured wedding invitation wording also works perfectly well for couples who are hosting their own celebration. Below you’ll find examples for specific family and host structures. You’ll notice that this first one – and a few others – drop the bride’s last name due to it changing very soon. at four-thirty in the afternoon. Theme: A touch of champagne gold. It is a bow tie affair. This next section of formal wedding invitation samples focuses on the groom’s parents hosting the event. You’ll see that it shares a lot of similarities with the previous samples, but also some clear differences. We’ll also take a look at how to word wedding invites for when both sets of parents co-host, and when one set hosts but want to show respect to the other parents. Mr. and Mrs. Brian Rupert Briggs request the honor of your presence at the marriage of Ms. Tricia Anne to their son Mr. Ryan Chan Bennett on Saturday, the ninth of November, two thousand and eighteen at two o’clock in the afternoon. Mr. and Mrs. Brian Rupert Briggs and Elder and Mrs. Castillo Stone Bennett request the honor of your presence at the marriage of Tricia Anne to Ryan Chan Bennett on Saturday, the second of November, two thousand and eighteen at three o’clock. Saturday, the ninth of August two thousand and eighteen at six o’clock. Informal wedding invitation wording has less of a focus on the particular order of words and lets your personality shine. All of the critical details are still included but leave room for a lighter description of the event, fun fonts, and puts more emphasis on the couple as opposed to the hosts. November 09, 2018 at four o’clock. You are invited to the marriage of Tricia Anne Briggs and Ryan Chan Bennett. We hope you will join us in celebrating our union on Saturday, the second of June, two thousand and eighteen at six o’clock. A reception will follow the ceremony at the same venue. 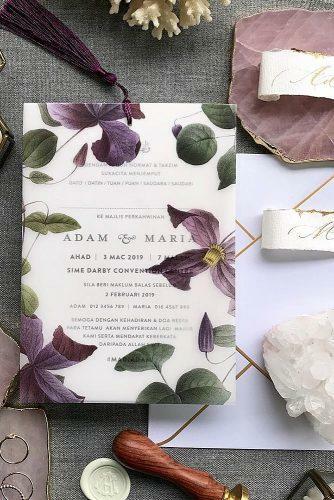 Modern wedding invitation can be more subtle than its traditional counterpart, yet still suitable for couples planning a religious ceremony. With modern wedding invites, the parents are mentioned as a courtesy as opposed to the main focus as in other versions. Sometimes the parents are not mentioned at all, especially if the couple is hosting the event. Again, there is much more flexibility with colors, fonts, and sentence cases. Check out a few modern wedding invitations samples below. Saturday the 2nd of November 2018. TRICIA & RYAN ArE TyInG ThE KnOt!!! 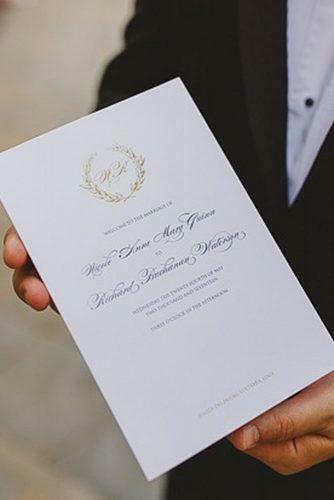 Casual wedding invitation wording is the polar opposite of traditional invites. All of the usual information is still included, but we love the room for creativity this style provides, especially when it comes to humor. 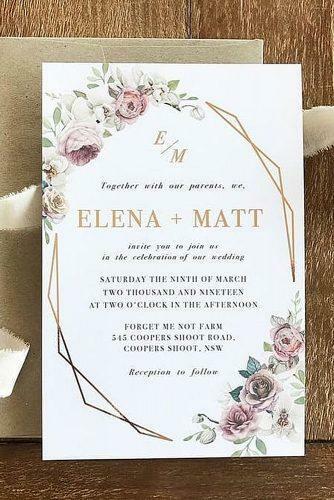 This style of wedding invitation wording also leaves plenty of room for poetry and quotes, and to go crazy with elaborate descriptions of the upcoming event. A celebration with brunch, drinks and dance will follow. Something borrowed, something blue, our Love as old as Time as our vows we say. The earth and skies as witnesses, on our wedding day. as they continue their life journey together a blended family, uniting under the law. See the RSVP card inside and kindly respond within two weeks. We will be attending your awesome wedding? What to do once you get in town? Sometimes less is more. For couples that want to keep simple wedding invitation wording to a minimum, this style is for you. 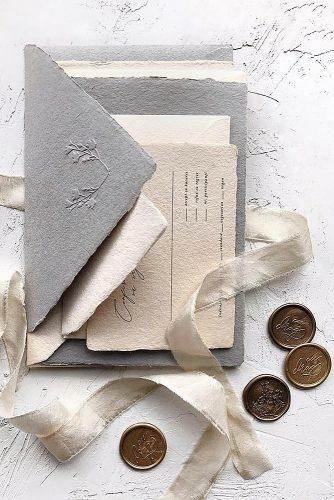 Perhaps you want to be a little mysterious with the details, or maybe you just want to keep things short and sweet because you’re sending your wedding invites out to hundreds of people. Either way, this wedding invitation wording style allows you to play around with fonts and colors. at twelve forty-five in the afternoon. Ryan Chan Bennett request the pleasure of your company at our marriage Saturday, the ninth of November two thousand and eighteen at half-past the hour of two in the afternoon. A reception of light refreshments follows immediately. 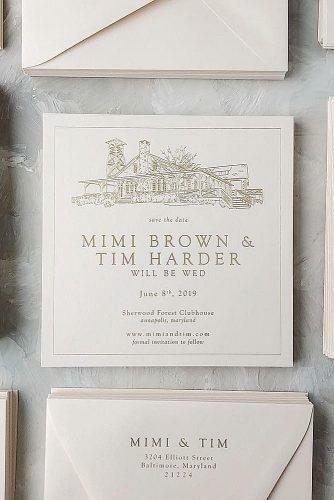 Every couple is different, and although the differences between all of these wedding invitation wording styles are subtle, it’s important to say things in a way which reflects who you are and the type of wedding you want to have. 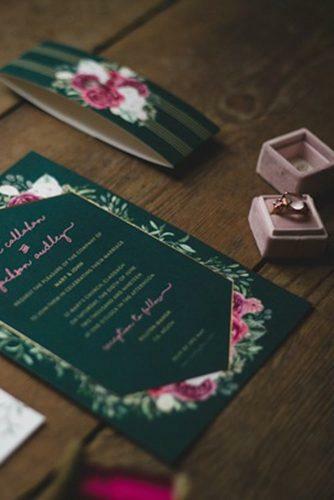 Perfecting your wedding invite wording may have seemed complicated at first, but If you follow our guide and match it with your hopes, dreams, and theme you’ll have no trouble at all. 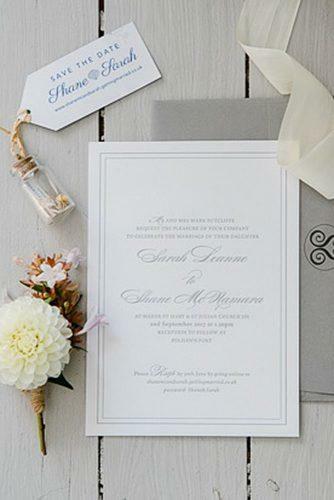 Check out this simple wedding invitation wording guide to format your own invites!